[REVOLUTIONARY WAR] [WILLIAM GODDARD]. Newspaper. 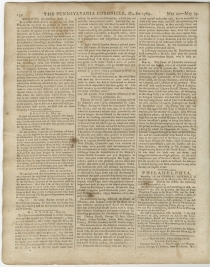 Pennsylvania Chronicle, and Universal Advertiser, May, 29 1769, Philadelphia, Pa., 8 pp., 9⅜ x 11¾ in. 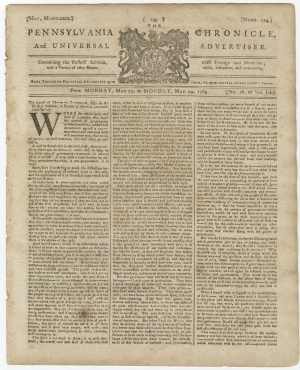 Prints the final part a speech of Thomas Pownall in the British House of Common’s “in favour of America,” which tries to legitimize the Townsend Duties. “Where the whole spirit and bent of a people, who have the powers of government within themselves, is fixed and determined against a tax—experience and common sense will convince you, that no civil power, no civil coercion, will ever assess or collect it. It will be found also in the trial, fact, that no military force can do this---it never did so long as the terms only of government remained ; it cannot assess or collect ; it may raise a contribution by military execution—but that, is not government, it is war….If the people are indeed in rebellion--it is a necessary war; but if they neither make nor intend any opposition by force or arms--if they have continued, & do continue, to pay the duties--what is there for the troops to do?...” (p. 149, col. 1). Includes a section on non-importation signed “From a Son of Liberty”: “As the welfare, happiness & freedom of America entirely depends on the virtue & prudence of its inhabitants...not to buy themselves...that has imported goods from England contrary to the agreement...” (p. 154, col. 1). Further sections report on non-importation. “In Boston there is handed about a printed paper with the names of eleven merchants who have imported goods into that port from Great Britain, contrary to the general agreement, with the design of casting the public odium on them & strongly recommending it to every one not to purchase any goods from them...” (p. 154, col. 2). 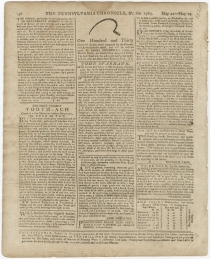 The handsome masthead features an engraving of the Pennsylvania coat-of-arms. One of the ads is for a cure for “The Most Violent Tooth-Ache (No CURE No PAY)” (p. 156, col. 1) .